Amistad Comes To Metro DC, Don't Miss it! For a couple of traveling journalists invited to Barbados on a media tour, the visit to the island was everything it is made out to be in those glossy ads that grace the pages of lavish magazines hawking the latest tropical cocktail mixer or suntan lotion. 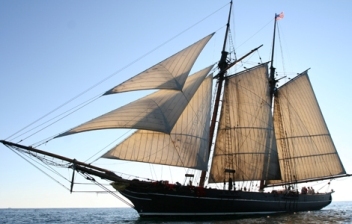 The scenery alone would have made it an "eventful enough" tour for me and my team of thrill-seeking, story-searching travel mates, but it was our sail on the Freedom schooner, an exact replica of the Amistad that made our visit an adventure . This fall, the Freedom will dock in Washington, DC and then in Baltimore, Maryland, providing a rare opportunity for locals to experience a pertinent part of our American history. The original Amistad, which means friendship in Spanish, was a ship made famous in 1839 when 53 African captives transported from Havana revolted against their captors. Led by Sengbe Pieh of the Mende tribe, the captives gained control of the ship and commanded the ship's navigator to return them to Sierra Leone. Instead, the ship headed north landing in Long Island, New York and was taken into custody by the United States Navy. Unjustly transported to Connecticut to be sold as slaves, the captives endured a widely publicized, two-year court case and ultimately won their freedom. They returned home in 1841. "Where people get it wrong is the Amistad story is not just a story about slavery, it's a story about economics," said Bill Pickney, an Amistad historian and captain of the Freedom. "The slaves were seen as cargo, just an impulse buy for a couple of wealthy men. They were stacked up on this ship with other commodities." It is jarring once you enter the belly of the boat and try to imagine 53 humans horizontally stacked upon each other along with carts filled with dry goods. The well-informed crew led by Captain Pickney, do a great job telling the story of the Amistad's voyage to America and the days leading up to the revolt. Photos of the captives, artifacts and diagrams are also on display to assist with what turns out to be a multi-dimensional history lesson. The ship's cook and colorful griot, Chef Dani Settle, keeps you intrigued with her stories of the captives, especially of young Kali. According to Chef Settle, Kali was one of four Mende children aboard the Amistad who learned to read and write, and wrote a powerful letter to President Quincy Adams, the captives' lawyer. Kali's letter assisted with the group gaining their freedom. Hearing these stories and many like them, along with touring the vessel is a history lesson you will not soon forget. Make sure you visit the Freedom when it docks at the Nation Harbor from September 16th - 22nd or at the Inner Harbor in Baltimore, Maryland from October 10-17. For more information and tour updates, visit www.amistadamerica.org.